Summary in English of the poem "The Parrot In The Cage". 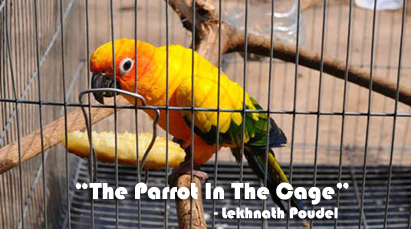 "The Parrot In The Cage" is written by Kabi Siromani Lekhnath Poudyal (1885-1966). Lekhnath Podyal is regarded as the founding father of modern Nepali poetry literature (Kabi Siromani) in twentieth-century. His most important contribution is believed to enrichment and refinement of its language rather than to its philosophical breadth. The best of Lekhnath's poems adhered to the old-fashioned conventions of Sanskrit poetics (kavya). Lekhnath, the first modern Nepali poet, wrote most valuable classical style of Nepali Poems. His poems are very much popular until today which often mentioned contemporary social and political issues as well. It is believed there were the first glimmerings of the poetic spirit that was to come after him. Summary/English Translation Of "The Parrot In The Cage"
The Poem is written through the perspective a caged bird, parrot. The parrot has a desire to go his real home, nature. A parrot is in cage, and he thinks it is his fate. He finds neither peace nor rest in the cage. Eve in his dream, he finds himself oppressed. The parrot's parents and relatives are in the jungle, which is his real home. From the cage, he cannot express his pain to them. He says, sometimes he weeps so much that his eyes swell and tears roll down. He feels himself a corpse (a dead body) and his spirit flies away. When he becomes mad remembering his pleasure in jungle, he jumps. He is a forest wanderer, who used to eat fruits, used to get delight in flying, and now is fated to be in the cage. He accepts that destiny has strange and mysterious ways. He thinks that he might have flown to different countries. But now his fate has put him in the hell, the cage, to a forest wondering child. Cool waters and shade are in the green jungle and the fruits are delicious there. All those things are vanished dreams today and only he has is fear in his mind. Delightful shades of the green forests, affections of the friends and family in eating and wandering together has all gone away. They are only his dreams now. He thinks that his parent might have been longing for him and that they might have tears in their eyes. Similarly, they may be beating their breast every day. The fate has separated the parrot with his parents. The bird sees his enemies all around. He finds no one to believe in. He is in confusion. He questions what he shall do and whom to express his plight. The bird thinks that once the whole blue sky used to be a field for his flight but now he is staying inside a narrow iron-cage. He desires to break the hell, cage, which has debarred his freedom. His pointed beak has been blunted and his wings and feet are restricted by the cage. He further questions how he shall pass his days. The parrot feels both cold and heat and sits alone silently. Seeing children playing, he curses his fate. When he remembers what his fate has given him, he passes his days madly. He weeps and his heart breaks. He looks at the sky when fear catches him and he says that he wants to die but without death's call, no one can die. Before the pains become unbearable, he thinks, he must die. He is given rice which is stinking. He is given water, but he has no thirst to drink. He thinks that his fate has conspired against him. His throat is dry, the cage is sharp and tight, People compel him to speak which he hates. When he refuses to speak, they poke them with a stick. He says that people force him to speak what they like. He thinks himself a weak creature; nobody is there to know what he wants in the cage. Thus, his heart is suffering. His life is imprisoned and forced to talk with the people around him. He curses his fate for such cruel pleasure. Then, he tells god that he did not just provide him speech, reasoning but also scolding threats and an enclosure. People enjoy anguishing him in the cage. He tells that human activities are sinful, they are doing crime. He requests god to make him free. Humans are careless towards right things, and exploit till the end. And how can this be said kind. He requests god to give this earth to human only. Do not create parrot or give him a place in heaven. 0 Response to "The Parrot In The Cage | Summary"